Denver Alert! 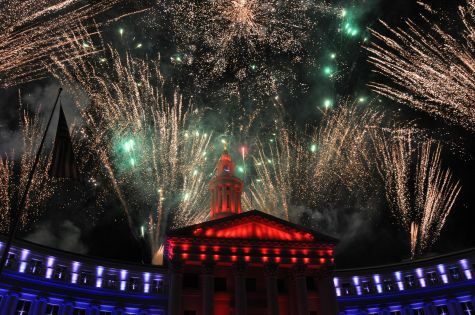 FREE Fourth of July Events Abound All Week! Tonight (July 3rd) is a big one. FREE amazing fireworks display at Civic Center http://www.civiccenterconservancy.org/ Pack up a picnic and head down to the lawn to stake out a spot for the evenings display, (seating is first come) starts around dusk. Elitches puts on a fireworks display on the Fourth at dusk. The Confluence is a great spot to watch from. The Cherry Creek Arts Festival (one of the top 3 outdoor arts festivals in the country!) begins on Friday the 5th, and goes all weekend. I highly recommend getting there EARLY. It starts at 10am, but I get there at 9, stop for a coffee, and start strolling. Parking is a bear after 10am. Most of the artists will be open an hour early. Oh, and wear comfortable shoes! …and of course, Friday the 5th is First Friday, and all the Denver Arts Districts (Santa Fe, Rino, etc.) will be in full swing, so go see some art! Have a Fabulous Fourth everyone! and stay safe. This entry was posted in art, Denver, lifestyle and tagged art, art district, art walk, cherry creek arts festival, Denver, denver 4th of july events denver free july events, denver art, denver fireworks, denver fourth of july events. Bookmark the permalink.